Boy Scout troop 811 enjoyed another successful Camporee in April. Camporee is an annual weekend competition in which all of the troops in our north Orange County district of Portola test their scouting skills. 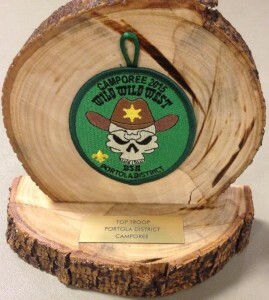 We won the coveted top troop award for the event because of our campsite, participation, and teamwork. Not only did our patrols do well in the many challenge events, but we did them well in the rain! Luckily, we had delicious food served by Grubmaster Mr. Swanson and other adults. Camporee is the only campout where the adults cook for us! They served root beer floats, tri-tip, baked beans, pancakes, and cobbler (but not in that order). Because of our great achievements, we now look forward to Mr. Glasgow drinking a disgusting substance of our choice. Great job Troop 811! – Troop 811 Webmaster Matthew R.